This is an age of stiff and cut-throat competition. It is all about “Survival of the fittest”. In today’s job market, you are expected to upgrade yourself on a regular basis. You simply cannot afford to be stagnant in one place. Here comes the importance of professional development. This is particularly applicable if you belong to any technical field. New concepts are being introduced in all the fields. Therefore, in order to be in the race, professional development has to be of utmost importance. It has become the new ‘buzzword’ and every employee needs to upgrade themselves accordingly. Go through concept in detail and get inspired to develop yourself professionally. What is the Scope of Professional Development? It is through Professional development, you can achieve a better and successful career. No matter which field you belong to; whether you are an engineer, software developer, doctor or any other field, it is a thorough professional development you will be able to attain the ultimate success. The process of professional development starts at a very early age. As a matter of fact, it was initiated the day you were admitted to school. Though, school education is not directly linked to your professional life; however, it certainly marked the foundation for your career. Like your school life, each and every step of your academic career is related to your professional growth and development. It is all about learning and upgrading yourself. In today’s market, dynamic and versatile individuals are the most preferred ones. The days for the stereotypes are long gone. Today, you are expected to be equipped with latest and updated knowledge in your field. Therefore, if you feel that you can relax once you are done with your education career, you have mistaken. You must continue with the process of learning for the years to come. Why is Professional Development Important for a Successful Career? In context with the modern day’s job market, the importance of professional development is immense. Your company would always want to extract the best out of you; that is precisely the reason why you are being paid for. With the help of professional development you can add to your skill sets and knowledge base, which would add to your credentials. Besides, it will also make you more acceptable to the job market at large. The following professional development guide or points will give you a clear picture about the importance of professional development. If you remain stagnant in one position for years, in terms of your professional skills, then you cannot avail the new opportunities which offer more lucrative packages. It is with the help of professional development that you can approach these new opportunities. With self development, you can update and modify yourself. This would make you feel confident as you will be in a position to apply for higher positions with better career opportunities. The confidence that you gain through professional self development training can help you become highly successful in the long run. Professional development plan plays a vital role to establish yourself in your future. With advanced knowledge, your productivity would start increasing at a rapid speed. This is exactly what companies expect of their employees. More productive you are, more valuable you will be to your company. With the help of professional development you will become more effective in your workplace. With advanced professional development skills and know-how, you would be able to deliver more accurate. You would be savvier to your work and would gain a comprehensive knowledge in your field of work. It would make you sounder and well equipped. And in return you will turn to be more beneficial for your company. 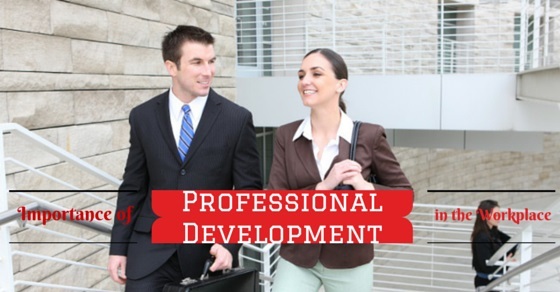 Professional development will lead you towards an improved and better career. The fact that you are improving yourself on a regular basis would make you effective and productive. These are the two most vital aspects which companies look forward to. Professional Development helps to raise the status quo. Being equipped with up-to-date and advanced knowledge, you will be able to help your peers in the workplace. This would certainly make your position stronger at the workplace. Professional development paves the way for your promotion in your company. Usually employee development or employees promotion is on the basis of their seniority and skills. When it comes to seniority, usually it takes a lot of time; however, promotions which are triggered by increased productivity and efficiency happen much more quickly. With professional development opportunities, you keep on adding more knowledge and skills. This makes you more versatile. It opens up new avenues for you which you can explore and can take yourself to a position that you have always desired for. Professional Development would increase your awareness about the demands of the job sector. This would motivate you to continue with your efforts of self development. These days, colleges and universities offer sufficient opportunities for professional development. If you utilize these opportunities in the right way, it can play a very important role for you to get a job immediately after your graduation. In the school, apart from the studies, you are trained in various other aspects like communication, problem-solving, critical thinking and others. When you step into college or university, more emphasis will be given on value addition. Value addition means making you suitable to meet the demands of the job market. Thankfully, these days, as a student, you are given a more detailed insight to a particular subject than it used to be in the earlier days. These days, the course curriculum has become more industry oriented and more emphasis is being given on the practical applications. It needs to be remembered, that irrespective of the field you have chosen, your professional training and development, in the true sense, begins from the time you start going to college. Therefore, as a student, it is very important for you to grasp as much as you can. Often, students leave it for the days to come. This approach doesn’t work anymore. These days, the companies expect you to be prepared for the day you join. Given the intense work pressure in the corporate sector, can be quite difficult for you to manage time for further professional development courses or research. Even if you can manage some time, you might not feel like putting in the extra effort. However, you have no other options. If you wish to stay in the race and improve your career, then you must take this much of a trouble. When it comes to professional development, there are usually two different ways you can go about it. These are listed down here. Take a look. Companies these days have realized the importance and value of their human resource. They understand that in order to get the best out of an individual, he/she must be trained and groomed. Therefore, in most of the multinational companies, they have arranged for various types of professional courses which they feel would make their employees more skillful and knowledgeable. In this form of professional development, where it is being initiated by the company, you, as an employee have a very important role to play. It is important for you to remember that no company would recommend all of its employees in a professional development program. They would recommend those whom they feel deserve some special treatment. What exactly is meant by a deserving candidate? It means an individual who is serious about his work, efficient and most importantly is keen to learn. Therefore, interestingly, even in the self development programs which are initiated by the companies; self initiative plays a very important role. If you are in a job which is more theoretical in nature, then you might go to book, articles, research papers and etc. These helps to improve and develop yourself all on your own. By gathering more and more you can not only develop your theoretical knowledge but will get an acknowledgment in your workplace. These forms of self development programs are applicable to those who are more into a practically oriented job. Engineers, IT professionals, Management employees and etc. are the ones who usually opt for these courses. There a number of courses that cater to specific knowledge areas and attending these will polish your existing skills and capabilities and will infuse new talents and expertise in yourself. Apprenticeship is not only meant for those who have graduated recently and are yet to step into the professional world. Even if you have a fair amount of experience in your domain, even then you can work as an apprentice. The difference would be, you will be working to add more skills and learn more about the subject you deal with. This is a very common form of a professional development program. Often, people tend to approach their peers or seniors in their workplace who have more knowledge over a particular topic and are more experienced. It would be a mistake on your part if you think that the person you have approached will give you everything he has. He would most likely show you the path, give you an outline or help you with advice; it is you who must take the trouble of working on it, doing some studies. Remember, your mentor has voluntarily agreed to help you. In order to get the best out him, you must put in some extra effort which would encourage him to give you more. Doing some research work is also a great way to achieve professional development. But this can be possible only if your company allows you to do so. In certain companies, employees are encouraged to carry out research and development work which is a very useful way of self-learning. Professional development is not an easy thing to achieve. It takes a lot of time, energy and effort to do so. You will find yourself in a zone of discomfort. However, if you are determined and motivated then you will be definitely able to move forward. Though it is difficult, remember it is not impossible to achieve by giving some effort from your side. Having provided you a brief insight on self development, at the end, there is one point which needs to reiterate. That is, self development is a continuous process; you must carry on with your initiative until you have reached a certain point in your career. Next articleHow to Create a Strategic Plan for Job Search Success?